For the campaign I’m running now, I wanted to build my own world. A world big enough to hold different types of adventures and make exploration fun, but internally consistent enough that it felt real. Now, there are some different approaches to world building. Some people like the bottom-up approach where they flesh out the one small part and build out as they go along. I’m closer to a top-down gal, where I like to have an overarching idea of what I’m doing before diving into the nitty-gritty. The thousand-feet view for me starts with general impressions and inspirations. What should the culture feel like? What level of technology and magic do they have? How complex are politics and society? How egalitarian or formal? These questions really affect the flavor of the adventures. A bronze-age ancient Greece made of small kingdoms with adventures driven by gods who use humans as pawns feels really different than a steampunk, Ottoman-empire Greece with Napoleonic-scale warfare. Even if you’re running the same sort of adventure both times (dungeon crawl, investigation, ship race, whatever) and the geography is the same and the system mechanics are the same, it will just feel different. So, I decided to start the adventurers out in one of the nations, the Weald. I wanted it to have iron-age technology, but high magic with a focus on nature magic (druids and nature spirits). 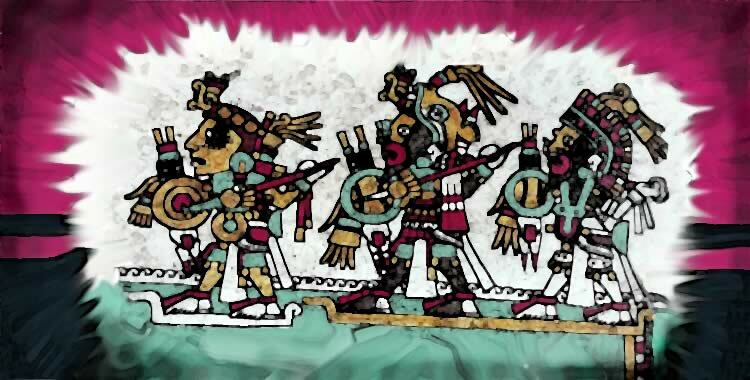 Politically, I imagined that it used to be really isolated geographically, and the people had never organized on anything higher than a clan level until a more advanced nation invaded. After a century or two of occupation and guerilla fighting, the more modern empire collapsed, leaving the Weald autonomous. But now they’d be aware of their shared culture and highly aware of their vulnerability, so they’d be trying to balance being a more modern nation with preserving their way of life. Flavor-wise, I was shooting for ancient Celtic after the Romans left, but more Irish than British. Cool. I had a picture in my head to guide me. I think a lot of natural top-downers do this the same way. The next part is a little different though, because for me the next most important thing to figure out was scale. And here’s where math comes into play. (Just do me a favor and imagine a chorus of angels singing in the background whenever I write “math” and you’ll have a better sense of what I’m trying to convey here). For role playing games it’s important to think through how long it takes to travel and communicate. which is a function of technology and world size. I wanted the travel between nearby cities to take a couple days, and travel from one end of the country to the other to take about a week and a half under the ideal conditions. Less than a month under bad ones. This constrains how small the country can be and how advanced and widespread the technology and magic can be. I wanted my players to feel like they had to make decisions in the field without checking back with authorities, but that the land was settled and they weren’t completely outside the bonds of law and custom. So I decided the Weald had decent roads between the major cities, but a lot of the country was rural. They only had a few teleportation circles in the major cities, and they were expensive to use. Other nations may have a more settled teleportation network. And rituals to talk mind-to-mind were used, but you have to know the person to contact them and it costs money, so they aren’t getting random policemen or the king or their aunt sally calling them up or vice versa. Druids can use animal messengers more cheaply, though, so they’re the best gossip network in the nation, but it’s a little quirky to use because the messenger will literally go “look, a butterfly!”, so it’s only for non-urgent messages. So then I had to take those vague preferences and make them into something concrete. These travel decisions gave me a framework to scale my world. Per D&D, travel time for adventurers is around 30 miles in good terrain. This fits historical sources pretty well, so I saw no reason to change it for my setting. Starting with the assumption that it would take about 10 days for my adventurers to travel from one end of the country to the other along good roads, that makes the Weald about 300 miles (30 miles per days x 10 days) in each direction, so that gives me a land area of about 90,000 sq miles (300 x 300) for the Weald – about the size of Belize. Then I looked at a globe and thought about how many other nations I would want to flesh out and how large a part of my world I wanted my country to be. I decided I wanted my country to be a bit of a backwater, and smaller than some of the surrounding countries, but I didn’t want to be building the world forever, so it couldn’t be too small in comparison to other countries. I didn’t have a firm idea of how many other countries I wanted to build, so I decided to tackle it another way. I started fleshing out the geography of the Weald. 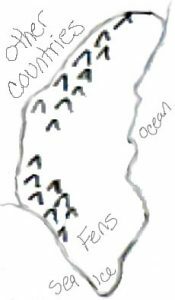 I knew it was an isolated backwater, so I decided it mostly had huge mountain ranges acting as boundaries in the north and west. To the east was an ocean that they hadn’t been able to cross. And in the south was the savage Great Fens and then an impassible arctic sea. The Weald got some trade through a few of the passes and by ship, but that region is not on anyone’s hit list for strategic locales to conquer or befriend. I made a quick pencil sketch of the Weald. It wasn’t a perfect square of course, because that would look weird, so the 300 miles x 300 miles I started with would have to change. My sketch looked skinnier than I wanted it to though. So, I decided I wanted something skinnier than square, but fatter than my sketch and still the 90,000 sq mile scale. I settled on a ratio of about 2:3 width-to-height. So, next question – what widths and heights give me a land area of about 90,000 miles? For that I whip out some school math. If the height (h) = 2/3 the width (w), that gives us an equation for the area that’s 2/3h2 = 90,000. Solving that results in 245 miles wide x 368 miles high. But that’s assuming a perfect rectangle, and I don’t want a perfect rectangle country any more than a perfect square country. My weald is more like a squiggly crescent. I can imagine that there’s a rectangle that would represent the total land area of the country. 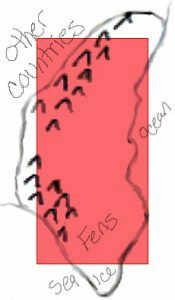 If I put it in the middle of the sketch, then the parts of the country that stick out of the rectangle would be about as big as the parts of the rectangle that don’t have country in it, if that makes sense. So, if I keep the same overall land area, that means I need to increase the maximum dimensions. I estimate that the actual maximal dimensions are around 5/4 the rectangle height. So that makes it about 460 miles tall, and take 2/3 of that to get about 300 miles wide. To simplify ecology and meteorology and such, I wanted to keep a similar axial-tilt/climate variation as the real world. That gives me what I needed to figure out the scale of the world. 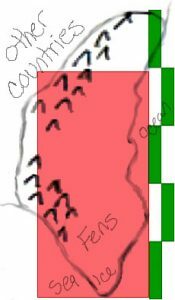 I decided I wanted the Wealding climate to range from the subarctic of the Great Fens a Mediterranean climate in the northern ranching lands. Eyeballing it, that means the Weald would have to span about 1/6 the globe north-to-south. That gives me room to fit the southern sea and the frozen south pole to the south of the Weald and a few countries, a sea, and the north pole to the north of the Weald. That feels about right. So that means the globe is 2,760 (6 x 460) miles pole-to-pole. The circumference is twice that, so it would be about 5,520 miles. If the circumference is 5,520 miles, then that means the radius (using the 2πr formula) is 878.5 miles. Using the formula for surface area (4πr2), we get about 9.7 million sq miles as the surface area of this world. If we have, say, 70% covered by ocean, that’s about 2.9 million sq miles of land to figure out. A little smaller than India, altogether. Hmmmm. Maybe. The Weald, at 90,000 sq miles is only about 3% of that, so I’d have to come up with a lot more land. That seems vaguely doable though, especially if I fill in some areas with vaguely defined big empires, so I decided to keep these dimensions. It was fun to do the math and poke holes in each other’s assumptions, but I really didn’t want to make the world bigger or rethink how the lower gravity would change jumping and climbing mechanics in the game system or how the changes in gravity and atmosphere and plate tectonics would affect the evolution of animals and plants and…it’s just a big rabbit hole. In the end I decided to hand-wave it and just say that it magically has the same gravity and atmosphere and and geology as our world. By the way, if you have a kid that asks you when they are ever going use the math they learn at school, you can just say that when they grow up from a little nerdlet into a great big nerd, they’ll need math to properly scale their RPG world. World Building Magazine is entirely devoted to doing nothing but world building. Druids can use animal messengers more cheaply, though, so they’re the best gossip network in the nation, but it’s a little quirky to use because the messenger will literally go “look, a butterfly!”, so it’s only for non-urgent messages. All I could think was that these Druids need to develop IP over Animal Messenger or IoAM technology!